Above is a sketch of what the B40 might have looked like if built with Bristol Centaurus engines. The sketch is based on a layout which appeared in issue 130 (summer 2007) of Air Britains Aeromilitaria magazine. I have elected to draw it with a Boulton-Paul dorsal turret with single 20mm cannon (such a turret was test-flown on a Defiant) and a four gun rear turret and single hand-operated gun in the nose, with a 40mm gun mounted to fire forward. This layout best conforms with the outline of the aircraft as it appears in Aeromilitaria magazine. However, the actual specification set out the defensive armament as two turrets each with two .50 inch machine guns, a 20 mm cannon in a power-operated mounting and 4 other .303 inch machine guns to be operated through side windows/hatches. The Blackburn B40 retracting-bottom flying-boat was a follow-on design to the Blackburn B20. The B20 had been designed with a shorter range (1,500 miles) than the mighty four-engined Sunderland Flying Boat (2,500 miles), But by 1940 the American PBY Catalina had shown that a two engined design could achieve the same endurance as the Sunderland and operate more economically. So in April 1940 ( a few weeks after the loss of the B20 prototype) a new specification (R13/40) was issued for a Sunderland replacement based around using the same principles as the B20, to be powered by either two Napier Sabre or Bristol Centaurus. It was anticipated that the new design would have the same range as the Sunderland but with increased speed and more effective defensive armament, to include a 20 mm cannon and perhaps a Vickers 40mm mounted in the nose for offensive use. The B40 was anticipated to be complimentary to the R14/40 project for a large flying boat with increased range (which led to the Short Shetland). The B40 design looked essentially similar to the B20, but had twin fins instead of the B20s single fin. An alternate view of what the B40 might have ended up looking like - this time with Napier Sabre inline engines, the specified 20 mm cannon mounted in the tail and with two turrets with twin .50 machine guns, one situated awkwardly in the nose and the other turret in a dorsal position. mounted further back to give a better downward view. At the time the B40 specification was written the need to be able to patrol in the middle of the Atlantic was not anticipated, since the hunting grounds of the U boats were then in the Atlantic approaches, but with the success of radar equipped aircraft by Coastal Command the U-boats were forced to operate at greater ranges. Thus in early1941 it was felt desirable to increase the range of the B40 to at least 3,000 miles. Design work continued and two prototypes were ordered (the serial numbers ES966 and ES979 being allocated) but it was just not possible to achieve the range required with two engines while still retaining armament, a decent bomb-load and an acceptable single-engine performance, so the project was wound-down in late 1941 with formal cancellation in January 1942. 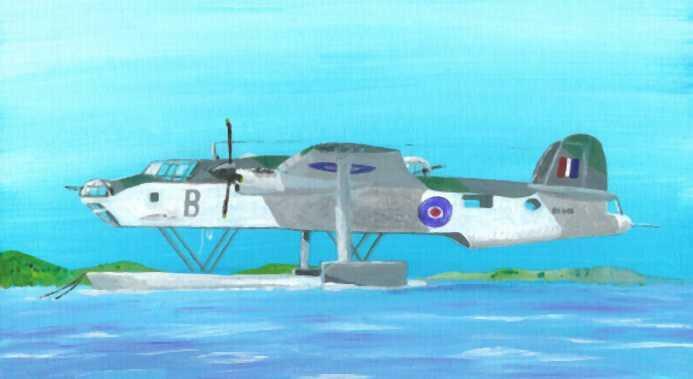 Blackburn B44 painted as it might have appeared if it had gone into service - In this case a pair have just attacked a Japanese A6M2-N "Rufe" floatplane fighter. The last project to feature a retracting float was the Blackburn B44 fighter to specification N2/42. It was designed around a Napier Sabre engine of 2,000 hp driving contra-rotating propellers, it was intended to be armed with four 20mm cannon. Descriptions of the aircraft stress that it was to incorporate large parts of the Blackburn Firebrand fighter in its structure (the project had grown out of the earlier B43 which was just the Firebrand with two traditional fixed floats). However the diagrams that survive seem to show little commonality with the Firebrand, for example the Firebrand had straight-edged tapered wings whereas B44 diagrams show elliptical wings. The B44 was clearly meant for use in island-hopping campaigns in the Far East and Pacific, operating out of sheltered anchorages. 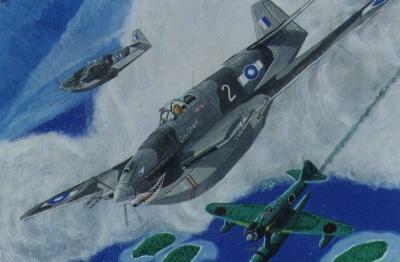 The project suffered from the extended development of the Firebrand and was eventually cancelled, although the idea of a flying-boat fighter was kept alive in the Saunders-Roe SR.A1 powered by jet engines. Air Britain Aeromilitaria Magazine Volume 33 Issue 130 Summer 2007 - Article "Blackburn B20, B40 and B44"
British Secret Projects - fighters & Bombers 1935-1950 by Tony Butler, Midland Publishing 2004 ISBN 1 85780 179 2.